Less than an hour from the nation’s capital, this grand Colonial mansion sits amid 80 acres of pasture and woodland. 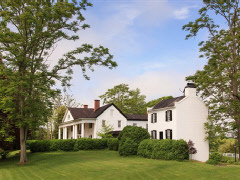 Built in 1766, it is said that both Thomas Jefferson and General Lafayette were frequent visitors to the Inn at Meander Plantation. Local legend also has it that George Washington encamped on the estate following the death of his friend (and owner of the property) Colonel Joshua Fry during the French and Indian War. Today, it offers a total of 8 guest rooms, including “Mr Jefferson’s Suite”, with many boasting views of the famous Blue Ridge Mountains. Others include the Shearer Suite, Lightfoot Room and Rapidan. The inn very much welcomes well behaved dogs.